There’s a lot of dissension among women and families. Differences in lifestyles that can create unnecessary division. Do you eat organic or not? Do you clean with chemicals or some other means? Do you cloth diaper or diaper with disposables? Do you work outside the home or from within by tending a household? Do you bike or drive the half-mile to work, keep chickens, buy eggs, home school, public school, read hardback books or e-books, cook or eat out? Ya’ll need to buy a water filter. People, we pay for the water that is piped to our homes, and yet, many of us still go out and buy water – gallons, bottles, or giant dispensers that keep us hydrated. Or our refrigerators filter the water, either through their own systems, or through the water filtering pitcher we keep in the fridge. These are all fine options, but I still know of one better. Others drink from the tap. I used a pitcher for a while, then tired of it, and then we used tap water for years. It’s filtered, right? Of course, it is. Still, there are many opinions on tap water, and many of those are negative. I’m not judging your tap water use, because I still use it when needed. I’ve visited water treatment plants, and do you know how I felt at the end of the tour? Thirsty. I felt thirsty. I wanted to drink a bottle of their treated water right then and there. Really, though… thank you to the people who filter the dirt and chemicals (some, not all, and please, stop adding fluoride) and poop out of our water. That’s part of our privilege – access to clean water. Taste. The Berkey water filter drastically improves the taste of your water. Try it. Compare water. You’ll notice the difference even when the water is used in cooking. Smell. I rarely noticed that my water smelled funny before. Don’t get me wrong, I’ll still drink tap (because I’m really not a snob), but after using a Berkey, I would have a really difficult time going back. If we ever move, it comes with me. I know people who have taken vacations and packed their Berkey with them. 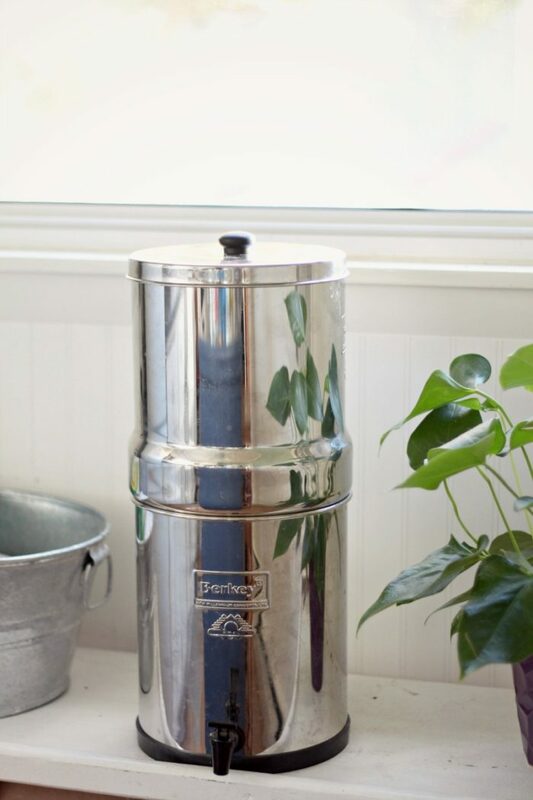 The Berkey filter leaves a fresh, clean result – pure water, with no smell. Just like water should be. Cost. The Berkey isn’t cheap, but it is a one-time purchase, and it lasts. It isn’t a revolving cost, and you don’t have to run to the store to buy more filtered water. Also, if the world fails us all, you can dump some creek water into this thing. Some parts of the purification system can be washed and used for approximately 6,000 gallons of water. Seriously! That’s years! The charcoal filter lasts about four years, and the fluoride filter about eight months. Check their website. Health. There are people with medical conditions that require them to strictly avoid fluoride. The Berkey filtration system removes fluoride, plastics, sediment, viruses and bacteria, and much more – all while preserving the minerals. Increased water consumption is an important benefit to anyone’s health, and this is achieved through better-tasting, better-smelling water. I drink far more water now, and I enjoy it much more. Ease of use. The Berkey system is simple! You fill it. It filters. You dispense water. Clean the tank with warm, soapy water once a month. Clean your filters according to the website (for example, after 6,000 gallons of water for the purification elements). I clean mine more frequently to increase the water flow, and I keep my Berkey full so that it’s always filling the reservoir quickly. The Berkey is a great size for your countertop (saving you that fridge space!). Plus, it looks really nice! My recommendation is that you don’t go for the smallest or cheapest if you’re a family of four. I understand if you’re single, but you’ll use more than you think. 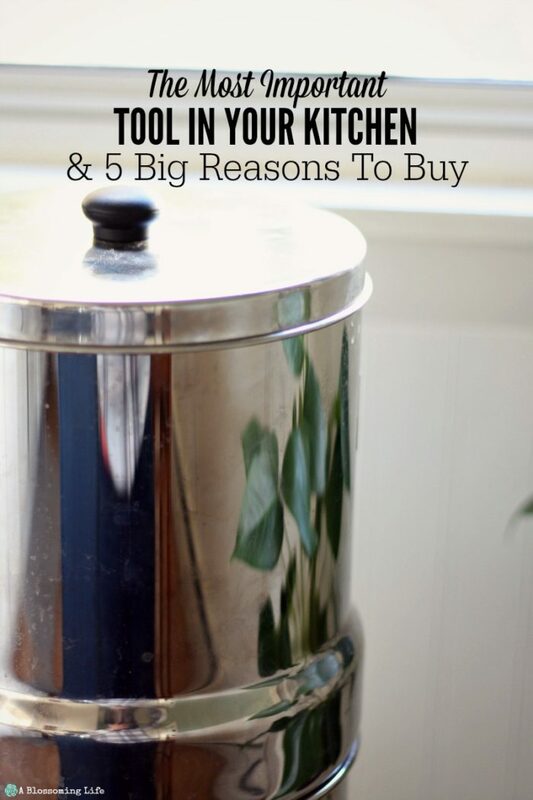 We purchased the Big Berkey for our family of four, and sometimes I wish we would have gone with a larger size. I love using the water so much. It’s always disappointing if I use it all up before new water is filtered (if I haven’t kept up with filling the filter), and then I substitute tap water. I’ve just become spoiled with the great taste and the lack of smell. I’m absolutely convinced it’s healthier. I really hope you’ll give the Berkey system a try. 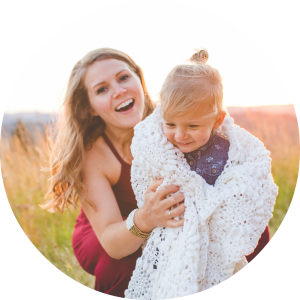 I wrote this post simply because I am beyond pleased with ours. It was my birthday gift last year, and my favorite gift thus far. I want anyone who isn’t aware of it to know about it, and hopefully, give it a shot. I guarantee you’ll love it. Read more about Berkey water filtration systems. Check out their test results here. They aren’t about opinions and anecdotes. They’re about research and evidence, which is really helpful. This is not a sponsored post. We just love our Berkey filter that much. This post does, however, contain affiliate links to help support A Blossoming Life at no extra cost to you. With Hashimotos and EBV my Berkeley water filter has helped speed up my recovery. I can’t even drink water in a restaurant just thinking about the fluoride that’s in it let alone the smell. I have my own glass water bottle with me wherever I go. That is awesome Kathy. We are pretty much the same. I can’t stand the taste of tap water anymore! We love our Berkey! It’s amazing how much more I notice the chlorine smell coming from our tap water since using the Berkey. We’ve been using ours for a couple months. It’s so true! It’s funny how you don’t realize those kind of things until they are gone. I never thought our water tasted bad until I started using the Berkey and realized how good water could taste. Family of four? Are you including the dog or is there something you’re keeping under wraps??? Hahaha! Libby actually wrote this article and she has 2 small kids. Although, I haven’t officially announced it here on the blog, but I am almost 20 weeks pregnant.